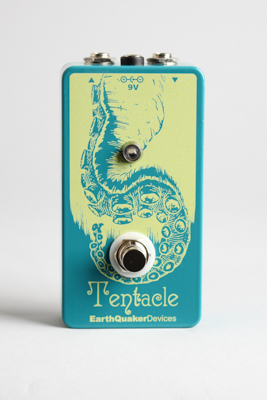 Earthquaker Tentacle Model octave up Effect (2016), made in Akron, Ohio, serial # 1077, Turquoise finish. Overall length is 4 5/8 in. (11.7 cm. ), 2 3/8 in. (6 cm.) width, and 1 7/8 in. (4.8 cm.) high. Overall New Condition.